Look! 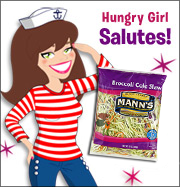 It's a brand-new HG feature... Hungry Girl Salutes! Each time, we'll pay tribute to a different all-star in the guilt-free food world. We'll give you ALL the need-to-know info, including tons of fun and delicious ways to enjoy its awesomeness. Today's honoree? BROCCOLI COLE SLAW!!! * Talk about a nutritional powerhouse! Not only is this all-natural item low in calories, fat-free, and high in fiber, but each serving is also packed with vitamin A (60% of the recommended daily allowance) and vitamin C (110% of the RDA). Not bad, broc slaw! * It's a convenient way to get your veggies in. This stuff is pre-washed, pre-shredded, and pre-mixed. Plus, you can steam it in the microwave right in the bag. Just snip a corner to vent, pop it in, and nuke for 3 - 3 1/2 minutes. Easy peasy! Low-Fat Salad Dressing - Guilt-free, flavor-packed slaw has never been simpler. Just toss these two together and let 'em get cozy in the fridge. Our favorite is Newman's Own Lite Low Fat Sesame Ginger Dressing, for an amazing Asian slaw. Thai peanut dressing is soooo good with steamed slaw -- like a cold sesame noodle swap! And don't be afraid to get creative with other light salad dressings. Use ranch for a creamy side dish, or try some fruity vinaigrette for a sweet slaw! Fat-Free Liquid Egg Substitute - Believe it or not, broc slaw makes an excellent omelette ingredient. And since it already includes a variety of veggies, you really don't need to add anything other than egg substitute (like Egg Beaters Original) or egg whites (and maybe a little low-fat cheese). Just soften the shreds in a pan with a little water, and then add your egg swap. Scramble or flip it up omelette-style, and CHEW! Low-Fat Marinara Sauce - Broccoli cole slaw is an amazing pasta swap. Just cook the slaw until soft (in the microwave or on the stove), and then add chunky tomato sauce. (We're obsessed with Dei Fratelli's pasta sauces, but there are MANY out there with great stats.) Instant saucy satisfaction, and you can eat a giant bowl of it for hardly any calories. 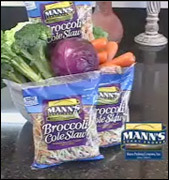 Check out our new recipe for a cheesed-up version of this couple, coming soon to a bag of Mann's Broccoli Cole Slaw near you! Broth or Light Soup - Soup rocks, and soup with veggie shreds rocks HARD. Amy's Organic Light in Sodium Chunky Tomato Bisque is by far our favorite, but broth-based soups (like Progresso Light) and pureed soups (like the ones by V8) are also FANTASTIC when paired with roughly chopped broccoli cole slaw. For broths or clear soups, simmer the duo on the stove until the shreds reach your desired texture. For thicker soups, nuke the shreds first, combine the two, and then heat 'n eat. YUM! * Fill out deli salads with broccoli slaw. Tuna's standard, but think outside the can! 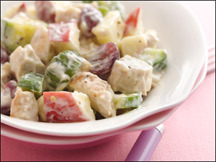 Add some to chunky chicken salad (with fat-free yogurt and grapes), salmon salad (with Vivi's Original Sauce), and even bean salads (try it in our Bean There, Yum That Salad in place of the broccoli florets). After some time in the fridge, the shreds will soften and soak up loads of flavor! * Create a filling, fruity salsa topper for chicken, fish, and more. Just add some shreds to sweet jarred salsa and let marinate overnight. You'll have a slightly crunchy and completely delicious way to zazzle up any boring protein dish. And it's a hot couple. Woohoo! * Add slightly steamed slaw to saucy frozen entrees. This stuff tends to take on the taste of whatever it's mixed with, so it's a fantastic way to fill out meals and snacks! Yup, another two-ingredient idea. Crunchy Sassy Chinese Slaw - We amped up an HG hot couple BIGTIME. Check it out! 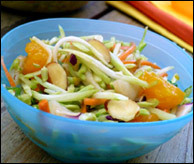 Scoopable Chinese Chicken Salad - This delicious slaw recipe can only be found in Hungry Girl 200 Under 200, but we'll let you in on a little secret... Nix the almonds from our Crunchy Sassy Chinese Slaw recipe, add 12 oz. skinless lean chicken breast (cooked and chopped), and up the dressing amount to 3/4 cup -- now you've got this recipe! Veggie Tuna Wrap Explosion and Noodlicious Veggie Crabcakes - These exclusive recipes from our first book, Hungry Girl: Recipes and Survival Strategies for Guilt-Free Eating in the Real World, are worth seeking out. So if you don't have the book, borrow it from a friend! Mmmm-azing Moo Shu - Chinese food never tasted so good, and no one would EVER guess this is guilt-free in any way. I Heart Apple Slaw - Ooooh... this one's a 200 Under 200 exclusive, but it's making its Internet debut in an HG email one week from today (Thursday, 8/13). Do NOT miss that! Today, August 6th, is National Root Beer Float Day. Top some diet root beer with a scoop of Dreyer's/Edy's Slow Churned Vanilla Light Ice Cream... or for a CRAZY-LOW-CALORIE float, add a scoop of frozen Cool Whip Free instead! It ought to be against the slaw to keep this email all to yourself. Click "send to a friend" and share it with the world!